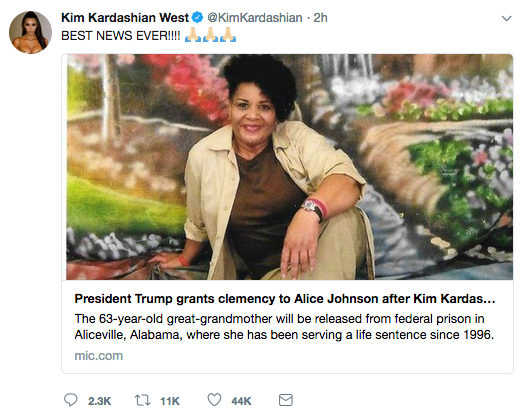 (CN) – Alice Marie Johnson, a grandmother whose life imprisonment for a first-time, nonviolent drug offense made her a cause celebre for criminal-justice reform, received a presidential commutation Wednesday on the heels of a much-ballyhooed White House summit with Kim Kardashian. Convicted in 1996, Johnson has been serving life in prison without the possibility of parole for her role in a Memphis-based cocaine ring that ran from June 1991 to September 1994. Poverty had driven Johnson into the trade as a jobless, single mother of five, who said that she never personally made drug deals or sold drugs. 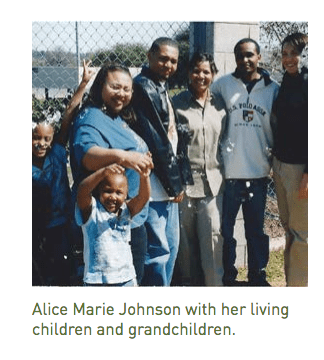 Johnson’s children petitioned three times for her clemency, losing their case most recently in December 2016 when then-President Barack Obama did not include Johnson on a list of 231 people granted clemencies. On Wednesday, a White House administration not typically known for criminal-justice reform granted Johnson’s wish. The act of mercy stands in stark contrast to the stated drug policies of President Donald Trump and Attorney General Jeff Sessions, who just last month rolled back Obama-era policies chipping away at mandatory minimums. Trump has praised Philippine strongman Rodrigo Duterte’s policy of executing drug traffickers and announced a policy emulating it. The White House insisted that it would not back down from this position. “While this administration will always be very tough on crime, it believes that those who have paid their debt to society and worked hard to better themselves while in prison deserve a second chance,” its statement says. Johnson’s pardon falls days after Trump met in the Oval Office with a fellow former reality star, Kim Kardashian. New York City tabloids were quick to note the meeting’s proximity to a much-vaunted tete-a-tete with North Korean dictator Kim Jong-un. 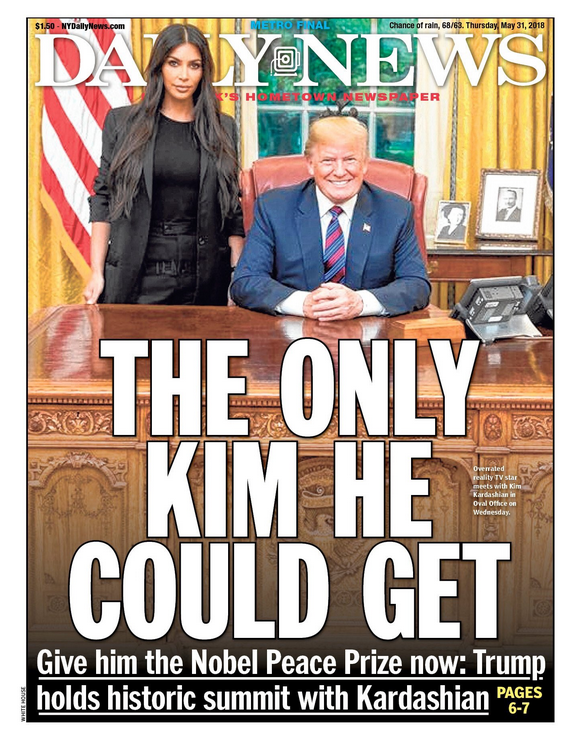 “THE ONLY KIM HE COULD GET,” snarked the New York Daily News. Praising the commutation of 63-year-old Johnson’s sentence, the American Civil Liberties Union urged Trump to extend his mercy to other deserving candidates. The ACLU featured Johnson’s plight in its 2013 report “A Living Death: Life Without Parole for Nonviolent Offenses,” which estimated at the time that 79 percent of the 3,278 prisoners serving life without parole were sentences for nonviolent drug crimes. “This report documents the thousands of lives ruined and families destroyed by sentencing people to die behind bars for nonviolent offenses, and includes detailed case studies of 110 such people,” the 240-page report said. In an interview with Mic last year, Johnson echoed the ACLU’s sentiments. Kardashian’s meeting with Trump reportedly occurred through backchannel negotiations with his son-in-law, Jared Kushner. Praising the commutation as the “BEST NEWS EVER,” Kardashian thanked both members of the family on Twitter. “I hope to continue this important work by working together with organizations who have been fighting this fight for much longer than I have and deserve the recognition,” she added later.